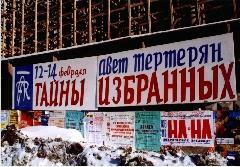 The Portal of the Philharmony was decorated with a huge poster and on many places in the town you could find the festival announcements. The festival found great and positive response in the media: TV and Press took part in the press conference and referred about the festival. 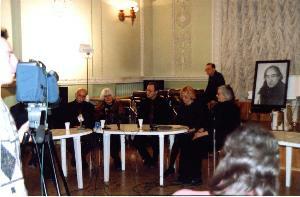 Participants of the press-conference, february 12, 1999. 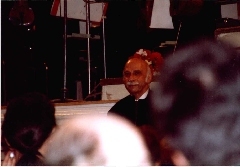 The festival program presented the musical world of Avet Terterian, works from Bach lead to Pärt, Khancheli, Gubaidulina and to his symphonies. 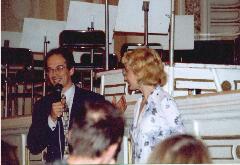 This festival was like an initiation to the music of Avet Terterian. 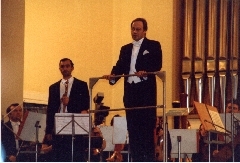 Nearly all concerts were sold out and the well informed audience was very attentive, thanked the orchestra, the solists and the conductors Dmitry Liss and Murad Annamamedov with Standing Ovations. 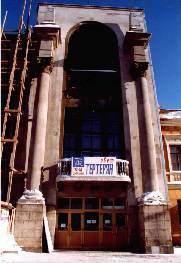 Avet Terterian once called Ekaterinburg his second hometown and the connection of the audience with Terterian was easily noticeable. 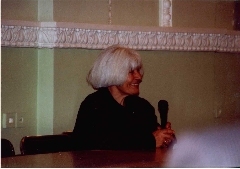 There were impressing events arranged arround the concerts: Ghia Khancheli talked with the audience after the performance of his composition Simi and answered their questions. 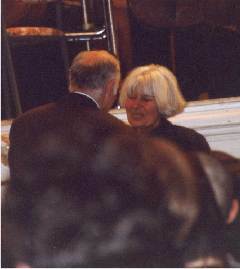 On sunday afternoon, before the performance of the two symphonies, Irina Terterian referred about life and work of her husband. 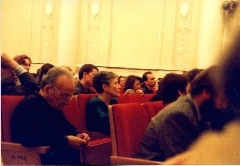 After the sunday concerts, at a closing phase of the festival, Lena Avvakumova, the organisator, and the two conductors D. Liss und M. Annamamedov referred about their memories of Terterian, about the evidence and eminence of his work in the contemporary music and the audience discussed with them. They expressed their gratefulness and deep emotions. After the official end of the festival, Alexander Koloturskij, Director of the Philharmonie, inivited to a meeting with all participants and sponsors. Particular Thanks to the members of the organisation Ani, an organisation of the armenian diaspora in Ekaterinburg, who helped very much to make the festival a success. 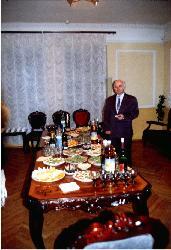 Lev Shulman, the director of the Centre of Contemporary Art in Ekaterinburg, who produced the wonderful choreography Versii II with the music of Terterian in 1992 and who belonged to his closest friends in Ekaterinburg, installed a memorial plaque at the house where the composer lived when he stayed in Ekaterinburg. This plaque was destroyed by barbarians. A new monument in honor of the composer was erected. The people of Ekaterinburg collected money for that, it should express the gratefulness and the admiration of the city of Ekaterinburg. This monument, more than one ton of metal, was stolen at night, and unfortunately, it was destroyed as well. The police found the pieces and could arrest the thieves, but the monument is cut in pieces and destroyed. It will need hard work to restore it. And it needs the support of the town’s administration.